Violence Hits Guantanamo Bay As Inmates Continue Hunger Strike : The Two-Way Inmates fought guards at Guantanamo Bay, Cuba, after authorities decided to end communal housing in one of the prison's camps, and instead put prisoners in individual cells. At least one detainee was reportedly injured by a rubber bullet in the clash Saturday. A view of the the U.S. Naval Station base in Guantanamo Bay Cuba. Guards and prisoners fought Saturday, as inmates were moved into individual cells instead of communal housing. 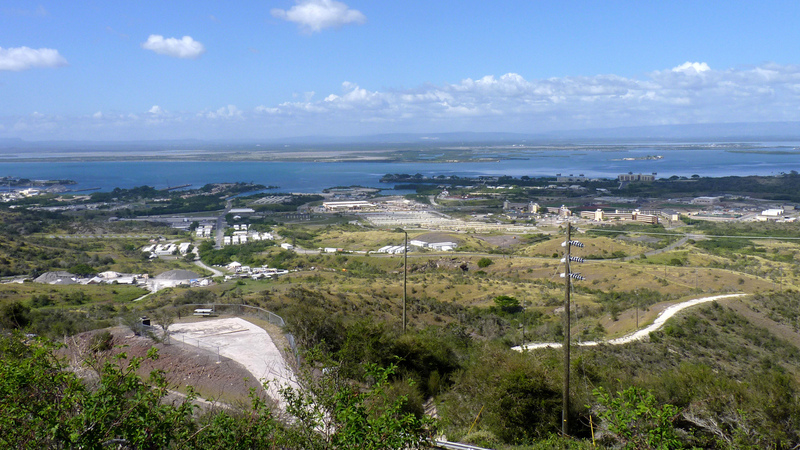 Inmates fought guards at Guantanamo Bay, Cuba, after military authorities decided to end communal housing in one of the prison's camps, and instead put prisoners in individual cells. At least one detainee was reportedly injured by a rubber bullet in the clash Saturday. The violence began after the facility's commander ordered the move Saturday morning. According to the U.S. Southern Command, the decision was made after detainees covered windows and surveillance cameras, limiting guards' ability to monitor them at all times. The forced transfer was also used as an opportunity to evaluate the health of the prisoners — dozens of them are on a hunger strike. "Some detainees resisted with improvised weapons," according to the official statement, "and in response, four less-than-lethal rounds were fired. There were no serious injuries to guards or detainees." The prisoners' weapons included batons, broomsticks, and plastic water bottles, according to multiple reports. The incident occurred in an area of Guantanamo Bay that had evolved into a "medium-security" section since the first inmates were brought there more than 10 years ago. According to The Miami Herald, a recent visit to the camp showed that the guards "had lost a measure of control" over the inmates. "The captives could be seen systematically disobeying communal camp rules. They covered surveillance cameras in individual cells with cereal boxes," writes Carol Rosenberg. "They refused to admit food carts to the cellblocks. Commanders said they were concerned that, out of view of the guard force, there were stealth hunger strikers who could suddenly die." Reports of the number of prisoners who are currently on a hunger strike fluctuate, with some news outlets citing the Pentagon's estimate of 43 prisoners out of a total of 166, and others saying the number is more than 60, citing sources in the military and the inmates' defense attorneys. Last week, the Pentagon named 11 inmates who were being force-fed so they would not starve themselves to death. As CNN reports, the hunger strike was prompted by inmates' anger over guards' searching their Qurans and other practices that began after a change in command at the base last summer.